Fall just shouts “apple.” The trees are heavy with their harvest and cider presses are in full swing. 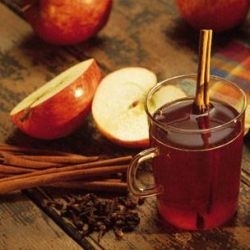 Enjoy one of these hot or cold cider drinks this autumn. Invite your friends. Iced Tea with cider, mint and honey: The cider and mint take away any bitterness in the tea and the honey adds a touch of sweetness. Apple Shandy: Mix your favorite light beer with cider and a bit of lemon for a satisfying drink. Serve ice cold. Chai-spiced Cider: Warm your chai, cider mix and add ginger, cinnamon, cloves, cardamom and a bit of anise.